Scale 01: A pointed scale, based on memories of movies when I was a kid! Scale 02: A rounded scale, based on a Japanese 'gyorin kozane' scale armour. Each mail texture consists of four 512x512 PNG images - texture, bump/displacement, normals, and ambient occlusion. For each mail I've also included a Poser 5 material (.mt5) file for applying the texture to any item, plus Poser 6 material collection (.mc6) files for applying the textures to Lourdes' free M3 Normans Outfit. Similarly for DAZ|Studio users each mail has a DS3 shader preset (.dsa) file for applying the texture to any item, plus DS3 material presets (.dsa) files for applying the textures to Lourdes' free M3 Normans Outfit. Because scale armour has a definite orientation, I had to do a simple remap of Lourdes' M3 Norman's Tunic so that the scale orients correctly on the sleeves. All other clothing items were acceptable with the original mapping. I've included the remapped tunic OBJ, and an edited CR2 that uses it. I'm 99.9% certain this is in accordance with the 'derivative' part of the license terms for Lourdes' original model, waiting for that final 0.1% confirmation! As always, please take a look at the readme. 3DCheapskate (2 years ago) Inappropriate? To acertain extent you can - check out the last promo image where I've applied them to Freak 4's skin and Poser 6 Jessi's clothes. You may get problems at boundaries between material zones.And depending on how the UV mapping is done the scales may not be aligned the right way. TheGreatXyz (6 years ago) Inappropriate? Thanks I was looking for scalemail for morrowind modding. caravelle (6 years ago) Inappropriate? Tybalt (7 years ago) Inappropriate? 3DCheapskate (7 years ago) Inappropriate? Dj - one request's good enough for me. I'll try to sort out a PDF version of the 12 steps I use - hope to get it uploaded here in the next week or so. Dj (7 years ago) Inappropriate? lumvaughan (7 years ago) Inappropriate? 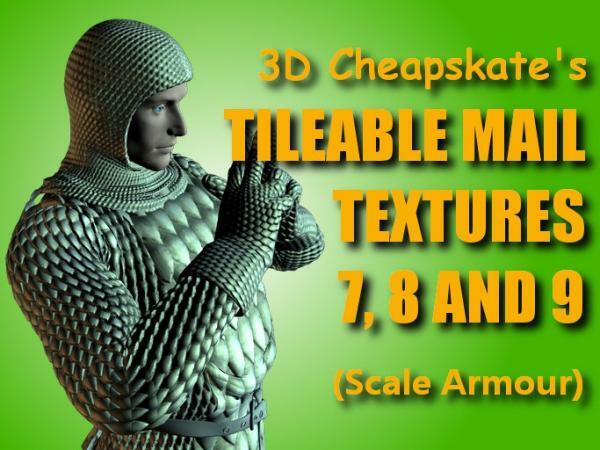 Absolutely outstanding, the "Set Tilling" feature is incredible, & works for chainmail too. Unbelievably lifelike when I applied it. Thank you so much for your outstanding textures, you are a master! luckyred (7 years ago) Inappropriate? Looks nice! Can't wait to check it out. Thank you!